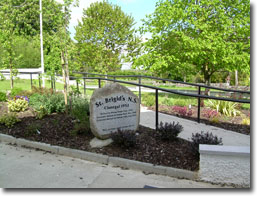 Situated in the picturesque village of Clonegal, St. Brigid’s NS, which was built on an elevated site in 1952, occupies a focal point in the village. The most recent refurbishment of the school building was completed in April 2014 and a new mainstream classroom and staffroom extension is currently in progress. There are 5 mainstream teachers, 2 ASD class teachers, a full time Learning Support teacher and 3 shared Resource teachers. There are 4 full time SNAs in the school – all working in the ASD classes. The school has a secretary and a caretaker/ cleaner, employed by the Board of Management. The very active Parent Association is extremely supportive of the school. It is affiliated to the NPC and its members become involved in many of the school’s activities. Each classroom is equipped with an interactive whiteboard, teaching laptop, visualiser and children’s laptops/computers. We have a school library which the children use each week in addition to a well-stocked library in each classroom. The school’s P.E. Hall is housed in the local St Brigid’s Hall where there is also a fully equipped computer room with computers, a networked printer and an overhead projector. There is a fully equipped kitchen in this building which is used by the school for healthy eating demonstrations and cooking experiences. Physical education is an integral part of our school curriculum. Children avail of swimming lessons in Graiguecullen pool for 10 weeks each year. There are 2 football pitches, a basketball court and a soft play activity area in the school grounds. Each year the local GAA club provides Football/Hurling training. A qualified basketball coach also provides training for the children and they participate in inter school/Cumann na mBunscoil leagues in football, hurling, indoor hurling, basketball, camogie and soccer. Teachers provide coaching in Hurling, Camogie, Football, Soccer, Basketball and Rounders as extra-curricular activities. We also have an after-school gardening club. Children’s artistic abilities are encouraged and nurtured. The Recorder is taught from 1st class up and the school regularly avails of schemes to develop musical and artistic abilities. All pupils avail of Music Lessons/Vocal Training with Music Generation Carlow – at no expense to parents. At Christmas each year the children participate in a school Concert or Carol Service. Irish dancing lessons are available in the local hall after school on Friday evenings and music lessons are held there one evening each week. We are very conscious of our beautiful surroundings in the village of Clonegal. We have developed several gardens in the school and the children actively learn Geography, Science and Care of the Environment while working in them. 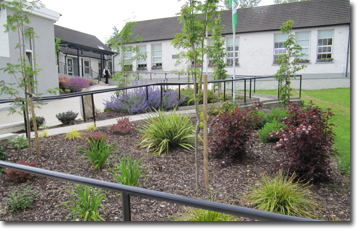 These gardens are a great source of pride to all in the school and we were awarded 1st place in the schools section of the Carlow Floral Pride competition this year - having already won it on three previous occasions. We are currently working towards our 5th Green Flag. We work in very close co-operation with the local Tidy Village committee and at the recent Award Ceremony, when Clonegal was acknowledged as the tidiest village in Ireland for the second year in succession and the overall winner in the South East region, three children from the school were honoured to be asked to accept the Gold Medal on behalf of the Tidy Village Committee. An After Schools service is provided by personnel from Millview Montessori school who collect the children at 2 o’ clock and again at 3 o’clock. This service is housed in the local St. Brigid’s hall and they avail of the facilities in the school grounds. Parents, or visitors to the school are always welcome. We may be contacted by phone, fax or email. or by calling to the secretary’s office between 9.30 and 2.00 each day where Mary is available to answer any queries. Further information can be acquired by checking the school’s website.